The composition of the Bible is indeed amazing. A library of sixty-six books, it was written by more than forty different human authors under the divine inspiration of the Holy Spirit. These writers wrote independently, knowing almost nothing of the other’s part. None had anything in common, and their literary qualifications were diverse. Moses, for example, was a man of learning, trained in the best universities of Egypt. Peter, on the other hand, was a fisherman without claim to formal education. Yet, each wrote the wisdom of God with powerful force. Christian church leaders of the fifth century A.D. decided upon the list of books to be included in the Bible. This collection of accepted writings came to be known by scholars as the “canon,” and were considered inspired and authoritative. Historical Books. The next twelve books tell of the establishment of the kingdom of Israel, of Israel’s repeated turning from God to sin, and finally of the Assyrian and Babylonian exiles — God’s punishment. Minor Prophets. These last twelve books of the Old Testament are called minor prophets only because they are shorter, not because they are less important. They are mainly concerned with Israel and the coming Messiah. Read one of the books from the choices below, and summarize it’s main points. Gospels. The first four books of the New Testament tell of Christ’s life and ministry. Jesus is the most remarkable and fascinating person in history. He has inspired more hope, taught more compassion, and shown more love than any other man who has ever lived. Jesus is the central figure of the Bible. His birth as the Jewish Messiah and Savior of the world was prophesied by Old Testament authors. Their writings contain more than three hundred separate references to the coming of Jesus, with many unique details. Christ fulfilled 100 percent of all the Old Testament predictions of the birth, life, death, and resurrection of the Messiah. The precise fulfillment of the immense body of biblical prophecy is found in one unique and revolutionary Man — Jesus of Nazareth. Claiming that He was the predicted One of old, Jesus stepped into time. And the pieces of the prophetic puzzle slipped into place. We can clearly see that He was the center of God’s revelation to man. What did Christ say of the Scriptures in John 5:39? What do you think Christ wants you to understand about the Old Testament from verses 26, 46, and 47? What did Peter conclude in Acts 3:18? What did Paul conclude in Romans 15:8-9 about the ministry of Christ? All of more than 300 Old Testament prophecies about the first coming of the Messiah were fulfilled in the life of Christ. Here are a few of them. Compare these Scripture references and record the prophecies fulfilled. 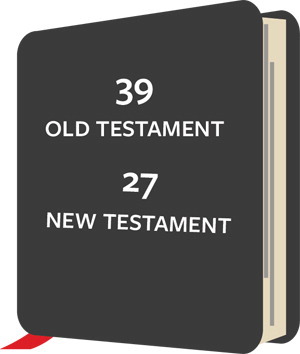 What is your impression after seeing these Old Testament prophecies and their New Testament fulfillment? The Book of Acts is a historical account of the acts of the Holy Spirit through the Apostles. Who wrote it? (Luke 1:1-3, Acts 1:1) How do you think the passage in the book of Luke applies to the Book of Acts? The Epistles are letters written to show the church the practical outworking of the life of Christ in the lives of those who wrote them. By example, they teach us regarding our membership in the body of Christ, and about our privileges, responsibilities, and destiny. Read Colossians 2:6-8. What are Christians to do? How are we to do it? Of what are we to beware? What would you say our greatest responsibility is? The Book of Revelation is the only New Testament book of prophecy. Read Revelation 1:1-3. This book is the revelation of whom? What is its purpose? Who gave such knowledge? How was this knowledge given, and to whom? How will studying Revelation affect your life and under what conditions? How will recognizing Jesus as the central figure of the entire Bible affect your Old Testament reading? Researchers in Israel subjected the first five books of the Old Testament to exhaustive computer analysis. They came to a different conclusion than expected. Skeptics had long assumed that the Torah, or Books of Moses, was the work of multiple authors. But scripture scholar Moshe Katz and computer expert Menachen Wiener of the Israel Institute of Technology refuted this belief. They discovered an intricate pattern of significant words concealed in the canon, spelled by letters separated at fixed intervals. The Old Testament was considered by its writers to be the inspired and authoritative Word of God. Our Lord Himself, the New Testament writers, and the early church, also affirmed its authenticity. Of Moses it is said, “Moses then wrote down everything the Lord had said.” (Exodus 24:4) David said, “The Spirit of the Lord spoke through me; His word was on my tongue.” (II Samuel 23:2) The prophet Jeremiah said, “The word of the Lord came to me saying…” (Jeremiah 1:4) Ezekiel, Daniel, and Amos made it perfectly clear that their messages were absolutely and wholly from God. While teaching in the temple courts, Jesus cited Psalm 110:1 and declared that David spoke by the Holy Spirit. (Mark 12:35-36) After His resurrection, Jesus said to His disciples, “This is what I told you while I was still with you: Everything must be fulfilled that is written about me in the Law of Moses, the Prophets, and the Psalms.” Then Luke notes, “He opened their minds so they could understand the Scriptures.” (Luke 24:44-45) The Jews used the expression, “The Law, the Prophets, and the Psalms” to represent the entire Old Testament. As the early church grew, differences in doctrines surfaced. But no matter how much the church fathers differed in their teachings, they were unanimous in one thing: that the entire Old Testament, God and Christ, the incarnate word of God, spoke by the Holy Spirit through men. They affirmed the writing of Paul to Timothy, “All Scripture is God-breathed and is useful for teaching, rebuking, correcting, and training in righteousness.” (II Timothy 3:16) Unlike other doctrines, the authority of the Scripture was indubitable. Belief in the absolute authority of the Scripture is foundational to your faith. I encourage you to study this lesson carefully and prayerfully so you will be able to assure others of the divine authority and sureness of God’s holy Word. The phrase, “Thus says the Lord,” or its equivalent, occurs more than 2,000 times in the Old Testament. What is different about each one? What is the same? What two statements of Moses in Exodus 31:18 and 32:16 show that God actually wrote the Ten Commandments? Summarize Christ’s attitude and view of the Old Testament. It is evident from their inspired writings that the apostles of Christ considered the Old Testament Scriptures prophetic and inseparable from the authority, power, and ministry of Christ. 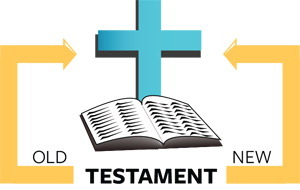 Describe how the information in this lesson give you confidence in the authority of the Old Testament. Write down several proofs of the authority of the Old Testament that you could use to explain to someone who doubts it. As you prepare to start this lesson, pick up your Bible and thumb through the pages of the New Testament. Have you ever thought about its origin and how its twenty-seven books were collected together into one volume? Since the first of the books was probably not written until about A.D. 50, the church did not have a “New Testament” for the first twenty years following our Lord’s ascension. Instead, the early Christians relied on the Old Testament and the eye-witness accounts of His disciples. Christianity began with the preaching of Jesus but was spread word-of-mouth by the faithful witness of His followers. Eventually the oral Gospel and the writings of the apostles to the churches were preserved for us in the books of the New Testament. The New Testament grew book by book, beginning with the writings of Paul. As Paul established churches in new communities, he kept in touch with them by letter. Beginning with letters to the Thessalonians, Paul corresponded with his churches until his death. He letters were copied, compiled, and circulated among the churches until they became known throughtout the Christian communities. As the years passed and the number of living eye-witnesses became fewer, the Gospels were written to preserve their accounts. Mark wrote his Gospel first, followed by Matthew, Luke, and John. In addition to Paul’s letters and the Gospels, other epistles, the Book of Acts, and the Book of Revelation soon appeared until the church had in its possession all the books of our New Testament by the close of the first century. These twenty-seven books, however, represent only a few of the numerous writings produced by the early Christians, many of which attempted to reinterpret the sayings and teachings of Christ. For more than two hundreds years, the church fathers could not decide which of those works should be considered written under the guidance and inspiration of the Holy Spirit and thus be approved for reading in the public services of the church. The need for unity in belief and practice among Christians eventually led the fathers to separate the writings that were in harmony with the teachings of Jesus from those that were not. The authoritative list of books developed slowly and gradually under the influence of the Holy Spirit until by year 400 most Christians had accepted the twenty-seven books that now comprise our New Testament. Today almost all of Christianity — Catholic and Protestant groups of many kinds — have placed their approval upon them. Finally, let it be remembered that the Bible is neither dependent upon nor affected by the success or failure of any book. Whatever may become of the latter, whatever may be the verdict passed upon it by an intelligent public, the Bible will stand. In the ages yet to be, when its present assailants and defenders are moldering in the dust, and when our very names are forgotten, (God’s Word) will be, as it has been during the centuries past, the guide and solace of millions. What four things did Christ say the Holy Spirit would do for the apostles? (John 16:12-15) Why do you think the apostles could not know all the truth at that time, and how would they in the future? How did Paul fit in according to Acts 9:3-6, Acts 26:13-15, and I Corinthians 15:7-9? What authority did Christ give Paul? (Acts 26:15-18) How do we fit into this as witnesses? Read II Peter 3:15-16. What did Peter think about Paul’s writings? What did he think about those who misuse the New Testament? Jude. What does this other half-brother of Jesus call himself in Jude 1? What do you think Paul, James, and Jude meant by saying they were bondservants of Christ? On whose writings is the foundation of the church of Jesus Christ established? (Ephesians 2:20) What is the Gospel of Christ according to the apostles in Romans 1:16. How does the information in this lesson help you trust the Bible more than you may have in the past? How will you use the deeper trust in witinessing? Praying? Daily living? I believe that knowledge of the Bible without a college education is more valuable than a college education without the Bible. Lila and her husband were expecting their fourth child and looking forward to the new baby’s arrival with eager anticipation. Then, unexpectedly, their dreams were shattered by a miscarriage. Not only was Lila grieved by the loss of the child, it soon became apparent that her life was in grave danger. Serious complications suddenly became evident, and she was rushed by ambulance to the hospital. Lila was vaguely aware of her surroundings as she slipped in and out of consciousness. Her family was at her side encouraging her, and many friends and loved ones were praying fervently. Somehow, in spite of the loss of blood and the close proximity of death, she was aware that she was not remembering the words just right. Yet, intuitively she understood that God was promising to see her through. Two weeks later, she returned home weakened but alive. While reading her Bible, she suddenly remembered the exact Scripture. God’s holy inspired Word has several characteristics that guarantee powerful results. First, it is infused with the power of the Holy Spirit. It has been said that a Bible that is falling apart usually belongs to a person who isn’t. That is because God’s Word is energetic and active, speaking to today’s world and our own personal needs and circumstances. Second, God’s word is truth. It awakens our conscience. With the power to reach into the private corners of our hearts, the Word bares our motives and secret feelings and reveals our hidden longings. Third, God’s Word discerns our true character. It exposes the weakness in our attitudes and conduct, enabling us to correct ourselves by the power of His Holy Spirit. As you study this lesson, I urge you to begin hiding the Word of God in your heart, drawing upon its wisdom for your life. Remember that God’s Word will never return to Him void, but will most certainly accomplish what it was sent to do. Share the Word with a friend, bearing witness to the faithfulness of our wonderful Lord and the power and authority of His Holy Spirit. Read I Corinthians 2:14. No one can understand the Word of God by his own ability. Why? Describe in your own words a natural man’s reaction to spiritual things. Explain in your own words how one must come to understand the Word of God. See I Corinthians 2:7-12 and Romans 8:5-9. Why do some individuals deny the authority of Scripture, the deity of Christ, the inspiration of the Bible, and other basic teachings in the Word of God? What should be our response to them? What is one way the power of the Bible manifests itself according to II Timothy 3:15? How have you experienced that power in your life recently? Before I became a believer in Jesus Christ, God’s Word didn’t make any sense to me. I tried to read it occasionally during my high school and college days, but found it boring. Finally, I concluded that no really intelligent person could believe the Bible. But when I becamse a Christian, my life was transformed, and my attitudes concerning the Scriptures changed. I realized that the Bible was truly the holy, inspired Word of God. For almost fifty years it has been more important to me than the thousands of books in my library combined. Second, Scripture is the basis of our belief. As the divinely-inspired Word, the Bible gives us God’s perspective on how we should live. If offers His pardon for our sins, reveals His purpose for our lives, shows us how to live peacefully in a world of turmoil, and commands us to appropriate His power so we can be fruitful witnesses for our Lord Jesus Christ. Many years ago, while I was a student at Fuller Theological Seminary, two gifted young evangelists came to speak during our chapel program. Both believed and preached the Word of God without questioning its authority. Later, however, they began to doubt that the Bible was truly inspired in every word. One of these men finally rejected the integrity of the Scripture altogether. As a result, he had no moorings on which to base his life and ministry. He is now a skeptic and an outspoken opponent of the Christian faith. The other young evangelist chose to believe that the Bible is truly the authoritative, inspired Word of God, and what he could not understand he entrusted to God and believed by faith. Few remember the name of the first man. But the second is Billy Graham, whom God has used to touch the lives of millions around the world. Fourth, the Bible reveals God’s attributes. It tells us that He is holy, sovereign, righteous, and just; that He is loving, merciful, and kind; that He is gracious, patient, and faithful. We have no trouble trusting Him if we really understand who He is and how holy, loving, and wonderful His purposes are for us. Fifth, God’s Word teaches us how to live holy lives and to be fruitful witnesses for our Lord. The more we read and meditate on His precious Word — and let His Holy Spirit control our lives — the more fruitful we become. Are you spending time meditating on God’s Word daily? If not, let me encourage you to begin today. As you study this lesson, ask God to reveal Himself to you in a fresh, new way, and let Him speak to your heart of His will for you. I encourage you to depend on God’s Word for your daily Christian living. Read Psalm 119. What does the psalmist call God’s Word in verses 1-7, 43, 72, 105, 123? What does this tell you about the importance of knowing God’s Word? According to Psalm 119:7-9, what does the psalmist recognize is accomplished by respecting and learning God’s Word? From Psalm 119:10-16, list at least three attitudes of the psalmist that show his love for the World of God. From Psalm 119:136, 158 what is the reaction of those who love Christ when His Word is not kept? 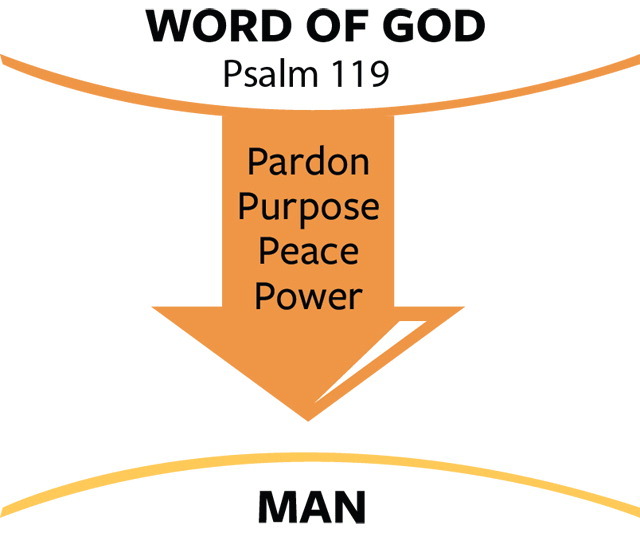 According to Psalm 119:11,32,63,74,157,176 , what should we do as a result of appropriating the Word? What impresses you most about Psalm 119? List three ways in which you recognize your personal need for God’s Word today? Search the Bible as a whole, shaking the whole tree. Read it rapidly, as you would any other book. Then shake every limb — study book after book. Then shake every branch, giving attention to the chapters when they do not break the tense. Then shake each twig by a careful study of the paragraphs and sentences. And you will be rewarded if you will look under each leaf by searching the meaning of the words. Study the Bible as a traveler who seeks to obtain a thorough and experimental knowledge of a new country. Go over its vast fields to truth; descend into its valleys; climb its mountains of vision, follow its streams of inspiration; enter its halls of instruction; visit its wonderous portrait galleries. Seek to understand the deep things of God. Study the Word as a miner digs for gold, or as a diver plunges into the depths of the sea for pearls. Most great truths do not lie upon the surface. They must be brought into the light by patient toil. Every time you and I read and study God’s Word carefully, we are building up our storehouse of faith. When we memorize the Word, our faith is being increased. Reading the Bible is vital for every Christian. How can we learn about God or grow spiritually if we do not spend time studying the Book in which He has made Himself known to us? Taking a few minutes each day to read a chapter is a good way to start. But we should also block out extended periods of time for exploring God’s Word and reflecting on what He is saying to us. When you personally received Christ as your Savior and Lord, you began a great adventure. That great adventure is mapped out in the pages of the Holy Scriptures. As you read and study the Bible in the power of the Holy Spirit, you will receive meaning, strength, direction, and power for your life. You will learn and claim the many great promises God has reserved for His own. Approach the Bible in prayer, with reverence, awe, and expectancy; with a willing mind; and with a thirst for truth, righteousness, and fullness in the Lord Jesus Christ. When you come with a humble and contrite heart, you can trust God the Holy Spirit to reveal truth to you, and you will experience the cleansing power of His eternal Word. Above all, as you study God’s Word, be eager to obey all that He commands, and rejoice in the knowledge that you are an ambassador for Christ, seeking men in His name to be reconciled to God. How do you feel about Bible study? What do you see at this point as your main purpose in studying God’s Word? Have you established a definite goal regarding Bible study? First, obtain at least two translations of the Bible. If you don’t have access to printed Bibles in your country, you can use this web site to access multiple languages and translations of the Bible: www.biblegateway.org. Study the various translations. You would not expect to learn much about the physical laws of our universe without diligent and persistent study. Should you expect to acquire much knowledge of God and the unsearchable riches of His Word without studying with equal diligence and persistence? As funds are available, you will want to secure a topical Bible, a concordance, and a Bible dictionary. Additional Bible study books are helpful and can be added as convenient. However, always remember, Bible study involves just that — studying the Bible. The other items are merely tools to assist you in getting the rich truths God has for you in His Word. As you consider each study of the Scriptures, may I suggest you record God’s Word to you in a journal. This will not only result in a deeper, more serious study, it will give you a written record of how God speaks to you and of your response to Him. List the tools you have now. List the additional tools you desire in the order in which you plan to obtain them. Mark and underline as God speaks to you through His Word. List the names of the principal characters; tell who they are and their significance. Select from each chapter key verses to memorize and copy them on a card to carry with you. Consider the characteristics revealed of God the Father, God the Son, and God the Holy Spirit. What is the principal subject of the chapter? What is the leading lesson? Who are the principal characters? What does it teach about God the Father? What does it teach about Jesus Christ? What does it teach about the Holy Spirit? Is there any duty for me to perform? Is there any prayer for me to echo? Choose a chapter from the book, and apply these questions. Topical study. Take an important subject – such as grace, truth, prayer, faith, assurance, justification, regeneration, or peace – and, using a topical Bible and a concordance, study the scope of the topic throughout the Bible. You will find it necessary to divide each topic into sub-topics as you accumulate material; for example, forms of prayer, prayer promises, examples of prayer in Scripture, Christ’s teaching on prayer, Christ’s ministry as we pray, the ministry of the Holy Spirit in prayer. What topic do you plan to study first? How much time have you scheduled for it? Biographical study. There are 2,930 people mentioned in the Bible. The lives of many of these make extremely interesting biographical studies. Why is it important to study the characters of the Bible (I Corinthians 10:11, Romans 15:4)? Using a concordance, topical Bible, or the proper name index in your Bible, look up every reference in the Bible of someone you would like to study. What was the social and political atmosphere in which he (or she) lived? How did that affect his life? What do we know of his family? What kind of training did he have in his youth? What was accomplished by him during his life? Was there a great crisis in his life? If so, how did he face it? What were his outstanding character traits? Who were his friends? What kind of people were they? What influence did they have on him? What influence did he have on them? Does his life show any development of character? What was his experience with God? Notice his prayer life, faith, service to God, knowledge of God’s Word, courage in witnessing, and attitude toward the worship of God. Were any particular faults evident in his life? Was there any outstanding sin in his life? Under what circumstances did he commit this sin? What was its nature and its effect on his future life? What were his children like? Was there some lesson in this person’s life that will help to enrich your life? By the time you complete the studies outlined in this series, you will have been introduced to each of these four methods. Your already have taken the first step in the book study method by reading the Book of Acts. Lessons 2 and 4 of Steps 2: The Christian and the Abundant Life were chapter studies. You will soon be ready to apply these as well as the other two methods to more advanced work in your own individual Bible study. What method interest you the most now? How do you expect to benefit from serious study of the Bible? Select one method and use it over the next week. Use the other methods the following weeks. Remember, always study the Bible with the following on hand: pencil, notebook, prayer, purpose. The following questions will help you review this Step. If necessary, reread the appropriate lessons. Write the divisions of the books of the Bible and the name of each book in each division. Review any division you do not know well. Who do you think is the real source of the authority of Scripture? Describe how this is evident in biblical history. Name at least three things the Word of God accomplishes that indicate its supernatural power. Write several changes that the Bible has made in your life. Be specific. Why do you need the Word of God? What steps will you take to be fully prepared for serious study of the Bible? The portion of Scripture you are studying. The method you are using. Lesson that is important to you. How you can apply it to your life. Results of previous lessons you have applied to your daily situations.Also, write prayer requests and answers as well as verses you have memorized. When you finish your study, begin with another portion of Scripture. Periodically review your journal to see how you are growing spiritually and to remind yourself of important lessons you have learned.